On December 14th, the Free! 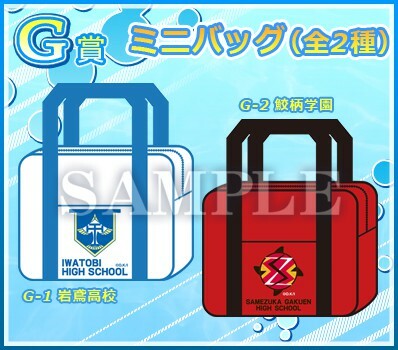 Anikuji will open, I would assume that this will be extremely popular!!! Check out the selections!!! Anikuji B-F : Character Figures - extremely adorable with their animal mascots!!! Anikuji H : Rubber Straps - incredibly adorable as well with the boys in their mascot body suits!! It sure is!!! 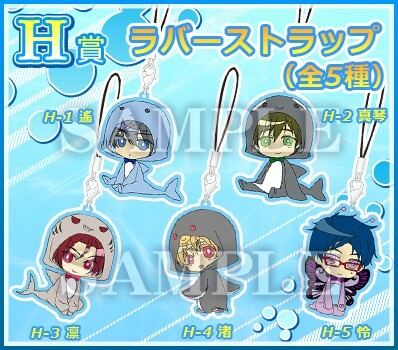 Those have special jerseys with fins and tail, and also a matching heart on the back LOL!!! Absolutely adorable!!! I feel a bit better though since they did a wide release of the Charapuka set (with the floaty inner tubes). I want to see them actually float~! xD I think they might?!? Incidentally, do you ever try your hand at lotteries? I wonder if I would if I could. I think I'd still just buy a prize second-hand lol, since it's likely I'd end up with something stupid. Yes, I buy the lotteries sometimes, like for Prince of Tennis, and Karneval, you can see some of those products under those pages. It's hard to get the things you want, everything is generated randomly, so you'll get multiples of some and none of others. Thanks =) Are you gonna buy the lottery too? Nah~ I doubt I'll ever bother with lottery. Unless a lottery of something came up and I was fine with 90% of what was offered. I'm like that with blind box stuff too, if I don't want to buy a whole case. LOL, I'll have to agree with you, Rei and Nagisa are way too cute!!! Though I'd say I love Rei's the most cuz it looks like he has no pants on and has butterfly wings, plus his butterfly hair clip LOL!!! On the 14th overthere, which means I'll have to stalk the site on the night of Friday the 13th... I wonder if that's a bad omen... hehehe, I hope I get some good ones and not too many repeats!! Rei is fabulous in his little figure. Love that they put him in his speedo and that the jacket (which is so cute! I need one like that!) is long enough to cover it hehe. Oh wow, is it really almost Friday the 13th? I never noticed since I'd been thinking about finals and I finish my last exam that day then I'm on break! Yay! But, who knows? Maybe you'll be really lucky and be able to hit most of the prizes! You were able to hit Nyanpowera and Young and Now Gareki which are suppose to be the hardest to hit, right? (Though you did buy a lot of raffles too for that) But yeah, I guess we'll have to see what you get then! Anyways, yes, I bought many many lotteries to get all of those plus the ones I've kept for myself hehehe~ And because you're limited to 10 anikuji per order, I had to make many separate orders hehehe... And I got the last anikuji with the Young and Now Gareki, it's nice!!!! I couldn't find out how to buy tickets myself and now is probably too late to do so. Thanks for your time and good luck with your own tickets. I hope you get everything you want. Oh, that's too bad. Thanks for letting me know. I saw a bunch of them up on yahoo auction but they're going for ridiculous prices. The current bid for a complete set of them is 20,500 yen!